Please let me know if a mini oreo cookie on top of a mini oreo cheesecake with lemon curd will get soggy? How long do I wait after putting on lemon curd to the put on the mini oreo cookie? Hi Frances – I would top it with curd and add the mini oreo cookie right before serving. What a great combination! I will have to try this; thanks! Really delicious I must say. I just love lemon juice mixed with cheese, this combination gives me great feeling . I will try this recipe this sunday we all love lemon curd very much. I am an absolute cheesecake junkie! I love lemon curd too and I have now had the pleasure of tasting yours!!! These are lovely and I am sure they were delicious! 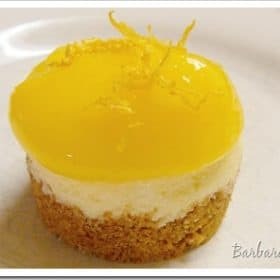 Lemon curd and cheesecake are a great combo. I'd love to get the mini-cheesecake pans, but if I keep buying baking pans, I'll have to move out.